1. Wash the chicken and cut into parts. 2. Prepare the vegetables for cooking. 3. Put the meat parts in 3 liter of cold water and bring the water in boil. 4. Take a spoon and get the skim off the top of the soup while it's boiling. 5. Now put carrots, parsley root, celery, peas and onion. 6. Add garlik cloves, season and salt. 7. Cook covered about 1-1,5 hours at moderate heat. 8. When the chicken is tender cut the pieces of meat into strips. 9. 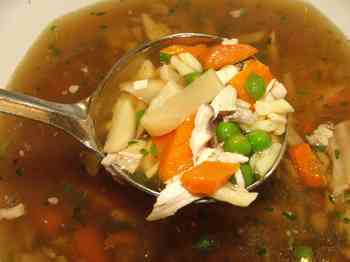 Strain the soup and slice the vegetables thickly. 10. Sprinkle with chopped parsley leaves. 11. Serve the soup with meat, vegetables and noodles.